#tbt to a few weeks ago when visiting Whitby to try some different places than we usually do. 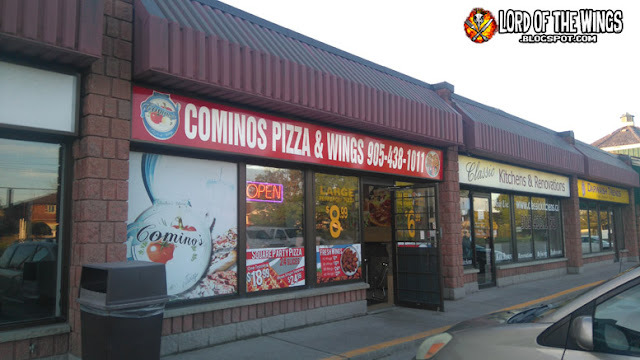 I found online Comino's Pizza & Wings and it seemed to be pretty popular. I went into the place and their phone rang non-stop for pickup and delivery orders. I'm not doing a full review because I was using a loaner phone and the pictures were not great. I went with a Pizza & Wings combo. 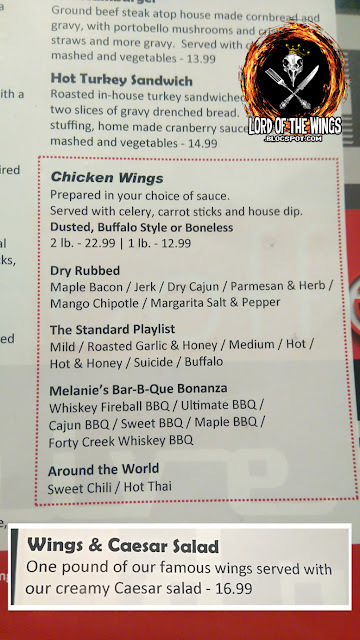 I was happy to find out that the woman taking the orders makes her own sauces for the wings - I really wanted to go with spicy but I knew the fam wouldn't. 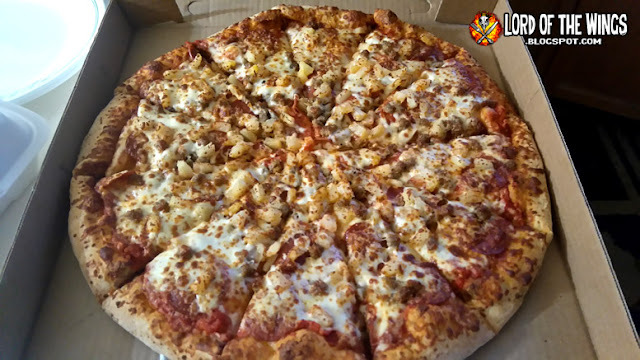 When I opened up the pizza box, I was in love. It looked like the perfect kind of pizza to me - the way the cheese melted, the thin-ish crust. I was impressed. 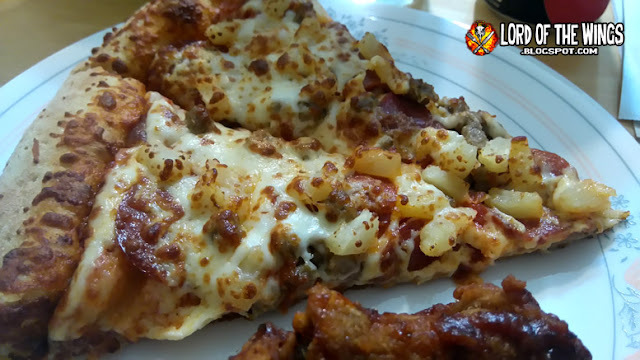 The pizza had pepperoni, Italian sausage, and pineapple. The crust was chewy and doughy. The crust had enough crunch for the crust, but was soft enough that the pizza was bendable. The cheese was stringy and perfectly cooked. The sauce was lightly seasoned but wasn't overpowering, nor was it thick (don't like it thick). Toppings were tasty, but were more concentrated in the middle of the pizza. This was one of the best pizzas I've had in a long time. I loved it and was frustrated because a) there is nothing like this in Ottawa where I live b) the wife and father-in-law were not crazy about it. I don't understand why not and I didn't get much feedback. 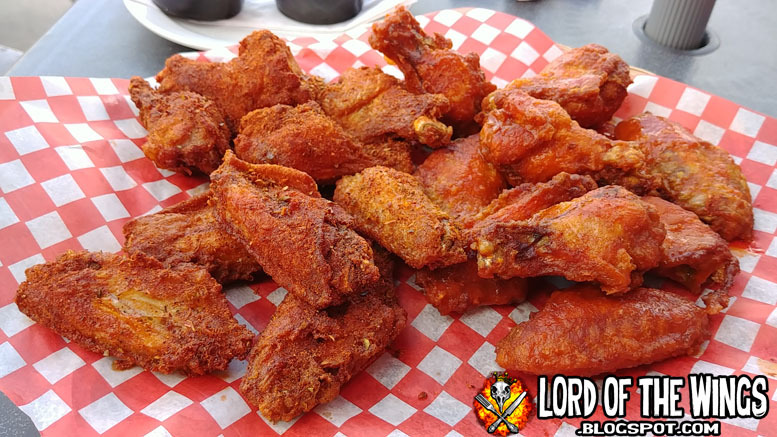 These wings were righteous. Not particularly big, but meaty, crunchy, and so very tasty. The homemade hot sauce was on point. Spicy - it had a bit. But it wasn't just hot sauce - it was clearly homemade and made with love. It was a bit peppery, kind of smokey, and just delicious. I've had wings like this before but I can't remember where, but I liked them then, and I liked these now. So I will go back and do a proper review at some point. I may be the only one going, but that's ok.
Not long ago we were back to the GTA for a family function, but the night before we decided to go out for dinner. We thought we would try someplace I have never been, but my wife did when she was in high school, Melanie Pringles. I really want to know the history of Melanie Pringles. Who was she? Was she a real person? I have no answers. 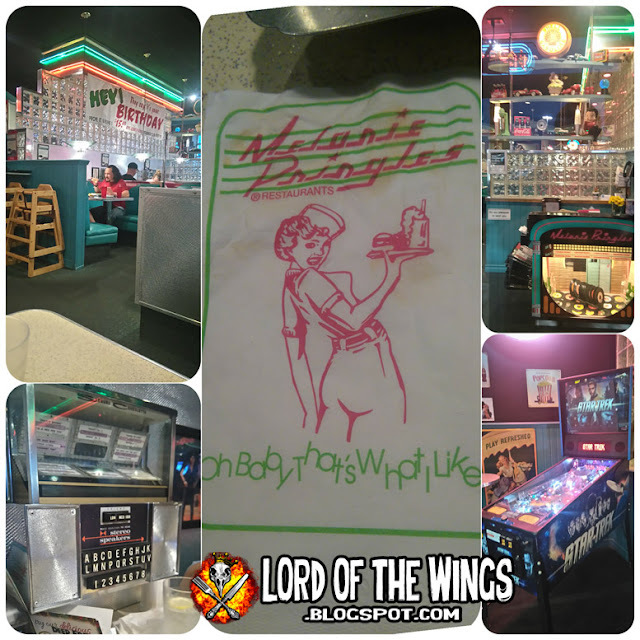 Why is this retro diner in a strip mall named the way it is? Here's what I can tell you, this place is like a 50-60's diner. Neon lights, 50's music, jukeboxes at the table. They even have a Star Trek pinball machine (its the 2009 Star Trek, but hey, what can you do?). The restaurant seemed old - I mean retro yes, but old like the carpet is long past when it should have been replaced. A little stale and in needing of a big cleaning. 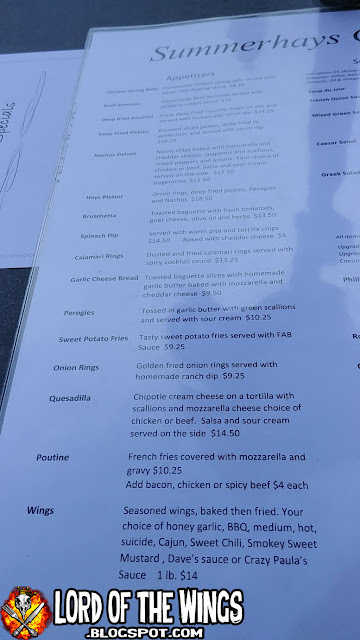 They have a huge menu - something for everyone. Sandwiches, burgers, pasta; they've got it all. 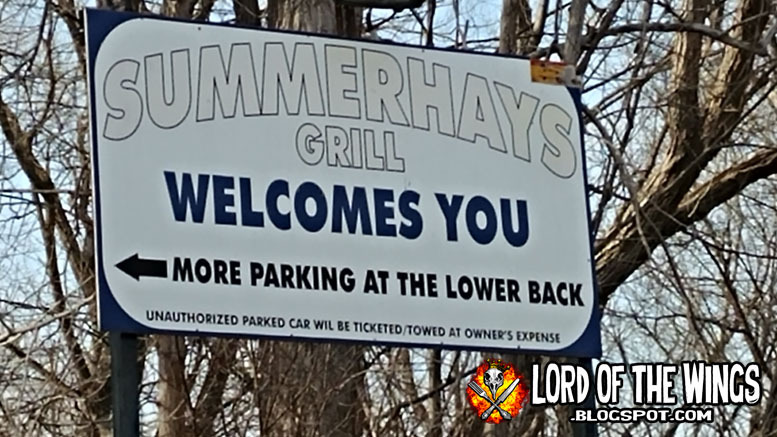 We were there on a Saturday night and they had a rib special on - a full rack for $18 but no vegetables (just the side of potato and coleslaw). That kinda sounded good, but I was pretty sure I was having ribs the next night, so I went with the wings. Several people had wings that night at various tables. I had a small red flag go off as we were being seated and I saw a customer decline to have her 5 or so uneaten wings packaged to go. Was something wrong with them? They have a ton of wing flavours - quite a few BBQ sauces and dry rubs. It was a tough choice. I also saw on another part of the menu they had Wings & Caesar Salad. That sounded perfect actually. The wife and the father-in-law both went with the rib special, but he got the Roasted Garlic & Honey Sauce and she went with the regular BBQ. The ribs were a huge slab and they were well sauced. They were very tender with the meat just falling off the bone. 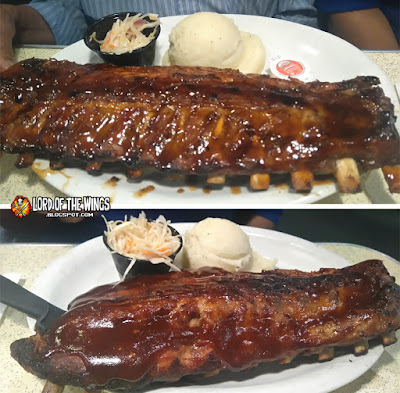 I tried the regular BBQ sauced ribs and the sauce was good (they both preferred the Roasted Garlic & Honey) but the grilled aspect of the ribs tasted like a propane-like 'fire'. They told me the sides were fine. My food came and I was pretty happy with my choice. I found it interesting that my salad came in a little frying pan. I liked my Caesar Salad. 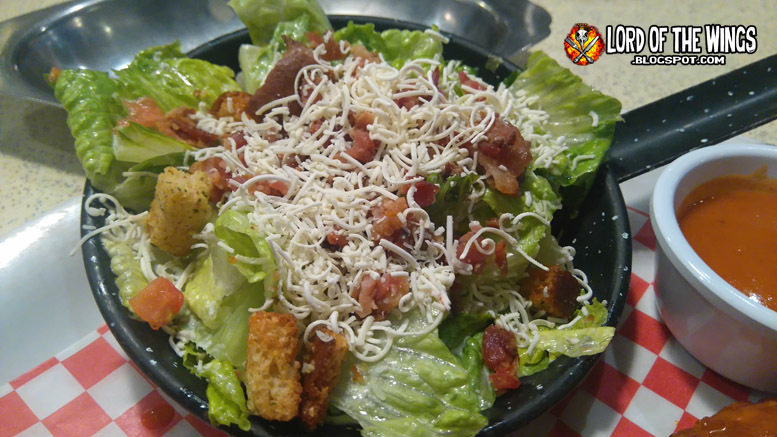 It was chocked full of real bacon, croutons and grated Parmesan cheese. The dressing was tasty, but it was described on the menu as being creamy and this was a very runny dressing. I was happy there was a lot of dressing, but it was just too watery. 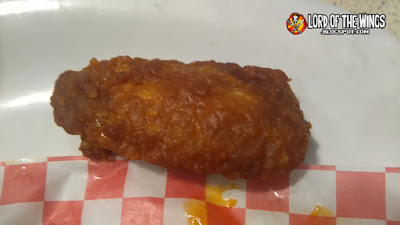 The usual wing order says it comes with celery and carrots as well as house dip, but mine didn't. I'm assuming it's because I got the salad version, and the double veggies would be too much? 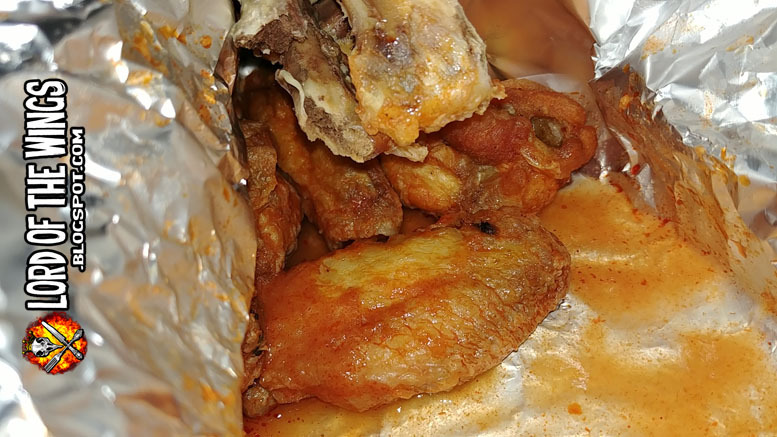 The wings come as a pound, which was about 8 wings in my case. You can have Dusted (which I did), Buffalo Style (which I think they mean just naked fried), or boneless. 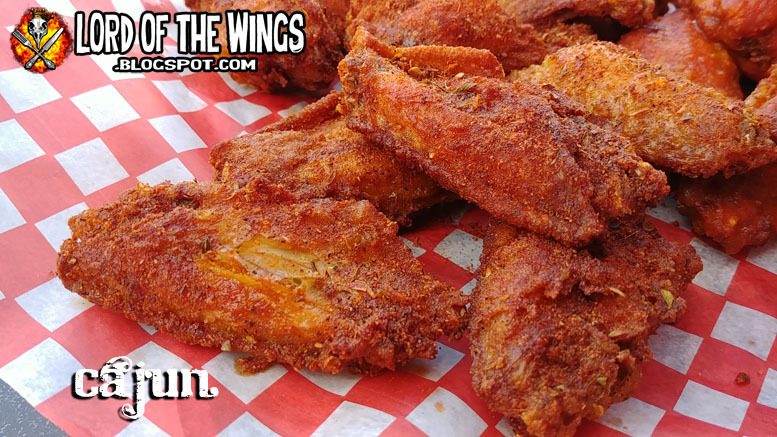 The wings are about a medium in length, but they are a pretty meaty wing. 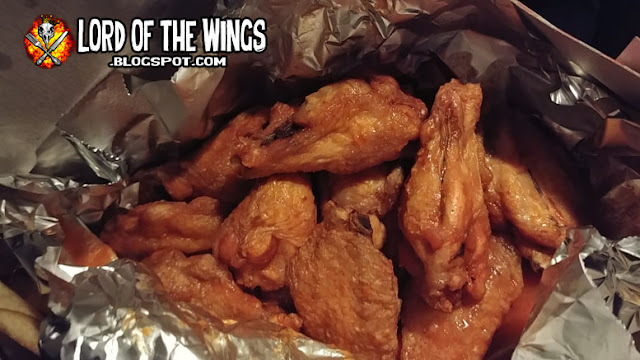 This is where the 8 wings become a pound because they don't look big until you pick one up. The wings were relatively crispy, with the dusting and deep frying acting like a barrier to the sauce, which didn't prevent the wings from getting soggy, but creating a slight skin rubbery netting. 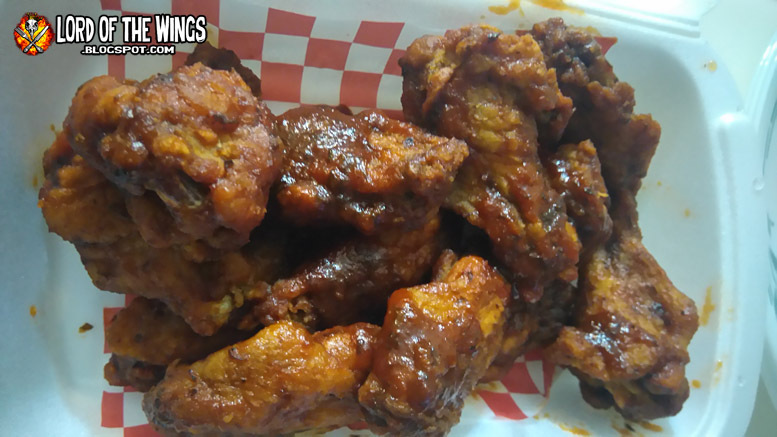 The meat was pretty tender and the wings were pretty well sauced. 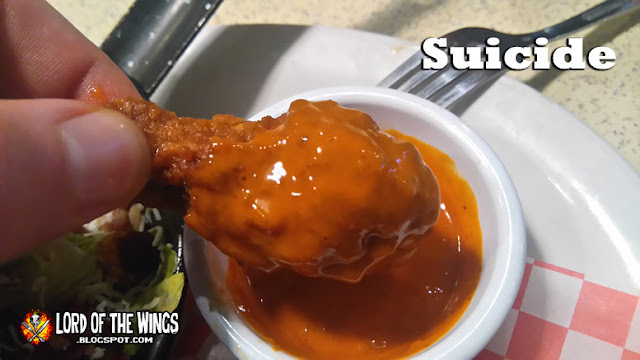 I ordered the wings as Buffalo sauced, with a side of suicide, but I just noticed that the wings in the above photo are covered in the Suicide sauce. 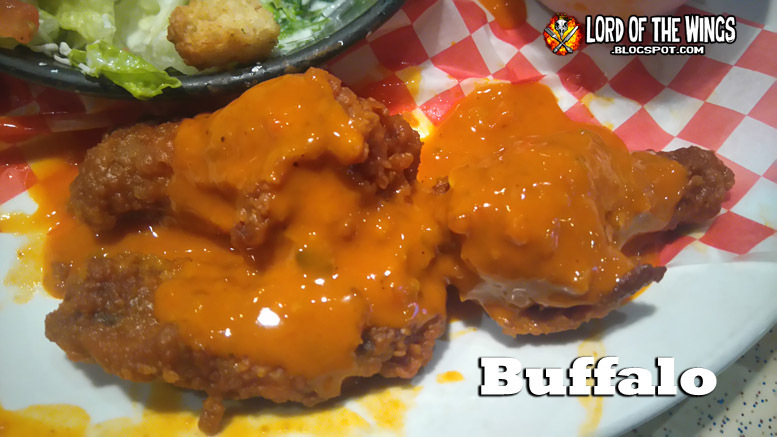 The Buffalo sauce is very orange and tastes like commercial butter/hot sauce. It's not real, but it tastes tasty enough. But it was even better with the suicide. The suicide sauce was kind of an upped Buffalo sauce. It had a nice bite to it (more than enough for the regular patron) but it also has a very sour, vinegary kick. I found it paired well with the Buffalo wings. So frustrated. Phone has had a mic problem, which hasn't been a blogging problem but I sent my phone in to be repaired and was given a loaner phone. I thought I had backed up most of my photos before the switch, and when they transfered to the loaner, not everything copied, but was ok. That phone was a piece of crap and had a terrible camera. I hated using it. I did a review or two, but I hated using it with social media, so I just avoided using it at all. Hence a week or more black out on my part. My phone came back a week later and then the store couldn't transfer ANYTHING over to my original phone. Then it turned out I didn't back up a bunch of photos I thought I had so I lost a lot. It sounds stupid, but it was kind of emotionally devastating. So I didn't feel like being on the old phone for a bit either. Oh and the problem didn't get fixed. It's better, but not fixed. But now I am super hesitant to send it back and be on a loaner phone. Frig. 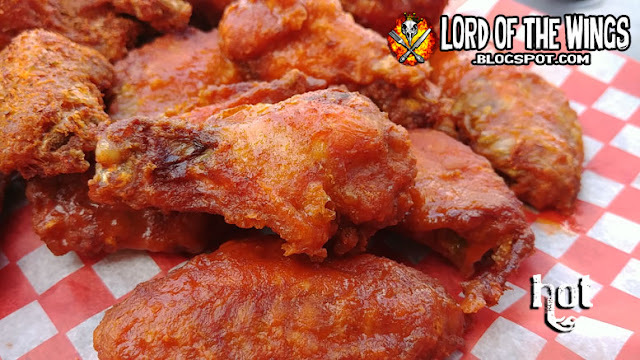 Anyways, I had these wings from Loblaws and they were pretty great. This is good because my local RCSS that used to make these wings stopped making them. This Loblaws isn't near me, but it's good to know its available. 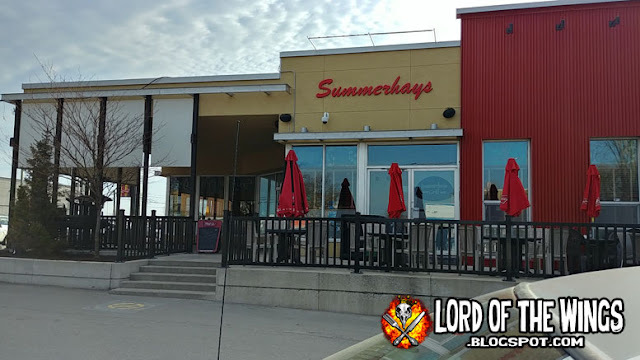 Back in 2008 I checked out Summerhays Grill in Centrepointe part of Ottawa. 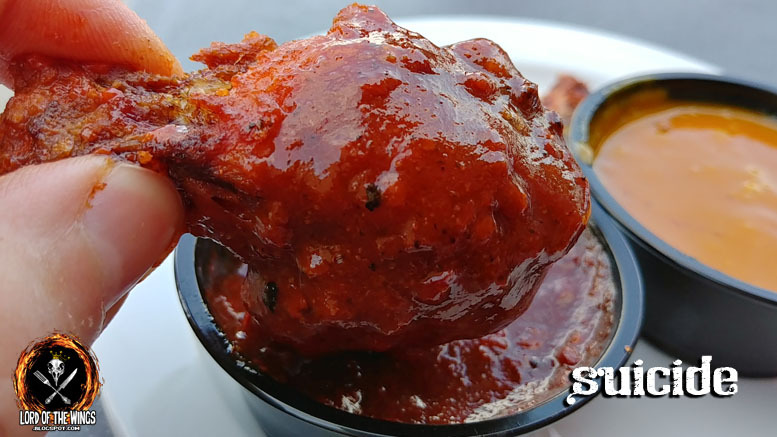 I liked the wing special but wasn't crazy about the sauces. I went back with a friend a few years after that, but didn't do a return review. 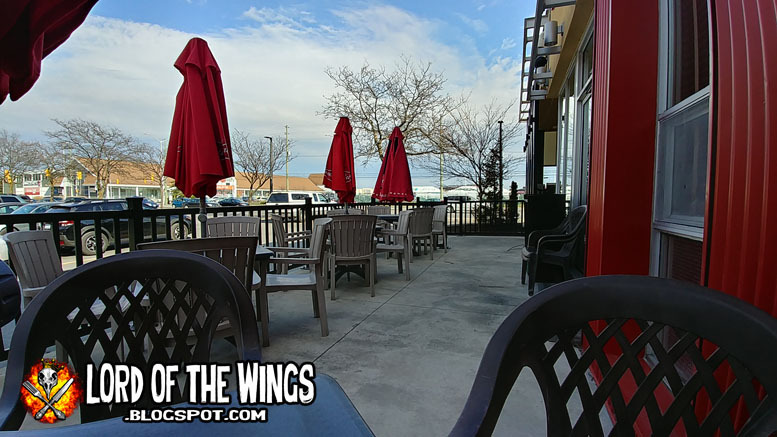 Well on a beautiful April night, I figured I'd go check out if they still had their wing deal and how the wings were doing 10 years later. 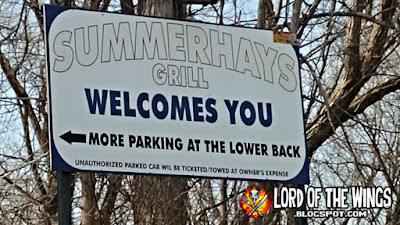 I was on my own for dinner and I rolled up to Summerhays, which has undergone a reno since I reviewed them 10 years ago. The parking lot was relatively busy, but I noticed the patio was empty. It was one of the most beautiful days in April after having an ice storm not too long before, so I decided I was going out there for sure. I couldn't believe that no one was sitting out there. I saw a slow, steady arrival of folks, but it seemed like many were getting take-out. 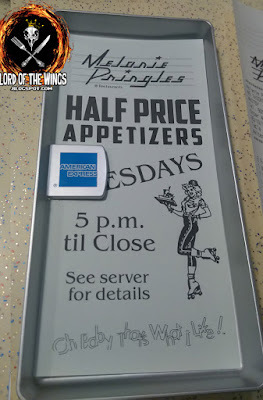 My server was Caity, who was a great server. She made me feel welcome, was friendly, checked on me frequently, and was doing some training of a new server. She answered a lot of my wing questions, like what the wing special was now or what Dave's sauce or Crazy Paula's sauce (its a suicide/honey garlic and suicide/bbq I think, I wasn't ordering so I missed the exact detail, sorry). 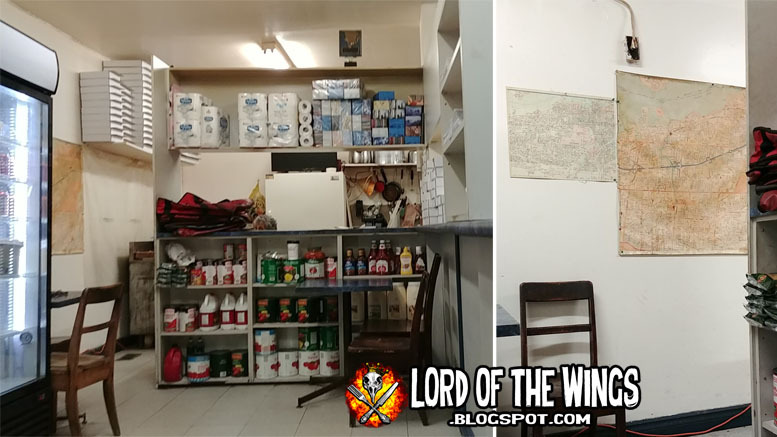 There are a lot of sauces to choose from, some are homemade, some coming from a bottle. 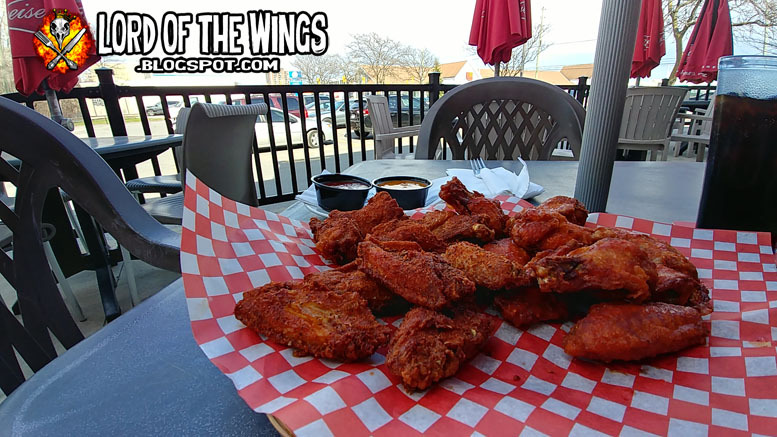 I didn't have to wait long and pretty soon I had a big feast of wings while sitting outside. The wings are described as being seasoned, then baked, then fried. That sounds like quite the process, but I'm not sure that is what they actually do. They just seem fried to me (well seasoned, then fried). 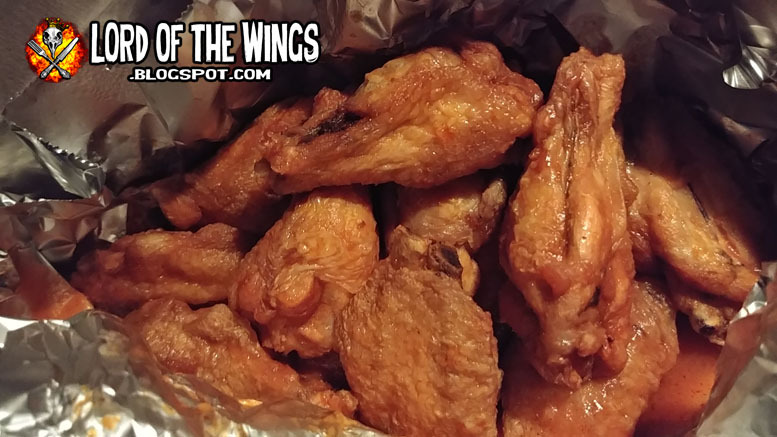 Wings come in by the pound, which works out to be about 8-9 wings in an order. I knew Summerhays' wing special as being something like everyday after 2 or 3pm being like $0.35 a piece. 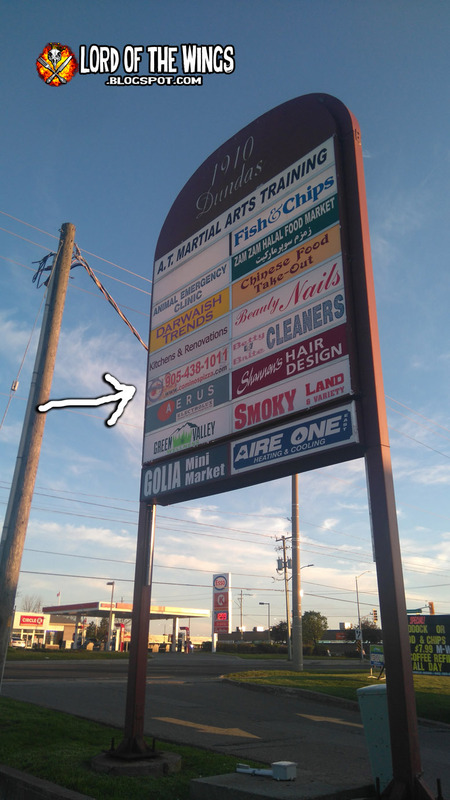 Caity told me that the deal now was everyday (Mon-Sun) half price after 12 noon. That seems crazy because that means they are $6.95 for a pound almost all day except for like 1 hour a day when they are $14 or for take-out. The chicken was a good medium medium-plus sized wing. They were pretty meaty too, especially the drummettes. The meat was average tenderness. The skin on the wings was very nice and crispy. Especially the dry rubbed wings, you got a real sense of the crispy texture. 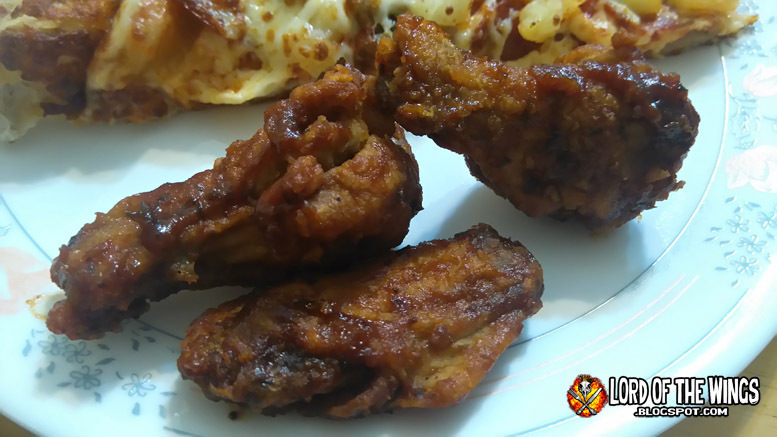 The sauced wings lost a bit of crispness but the wings didn't get soggy. I went with 2 orders and 4 flavours to maximize my tasting and reviewing. 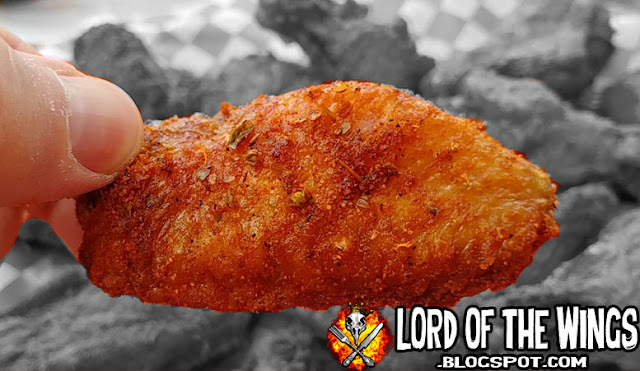 1lb of Hot, 1lb or dry Cajun, with Suicide & Smoked Sweet Mustard on the side for dipping. They charge $1 a piece for the extra sauce, but they came in giant containers, so I didn't mind. It was ok. As I ate it, I thought it was kind of cayenne-y, but also tomato-y which I wasn't crazy about. 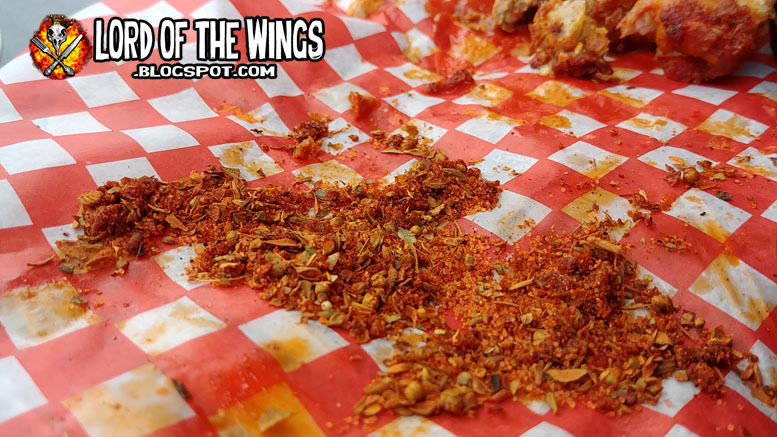 Near the end of my wings, I found a little sauce deposit at the bottom. I tried just the sauce and it was very buttery, salty, Buffalo-y taste. So where was the tomato flavour coming from? 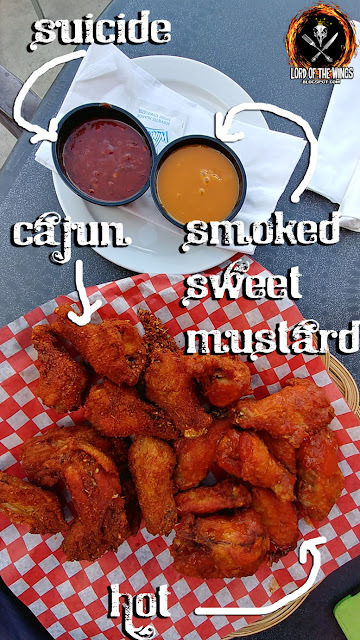 I went back and tried the sauced wing and had that tomato flavour again. I don't know what was going on. This was a great Cajun dry rubbed wing. Lots of flavour, your garlic, the salt, the herbs. This was a really seasoned wing. 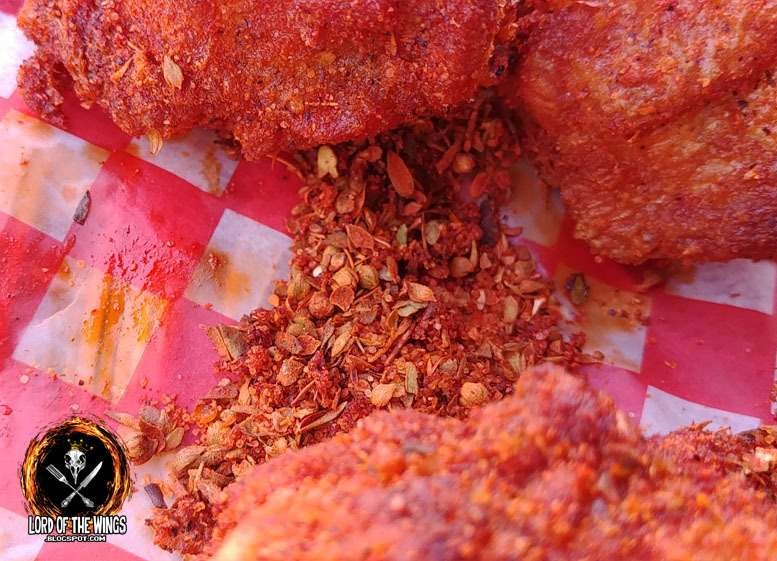 There was a very generous amount of the rub. Look at that big pile of spices and seeds! 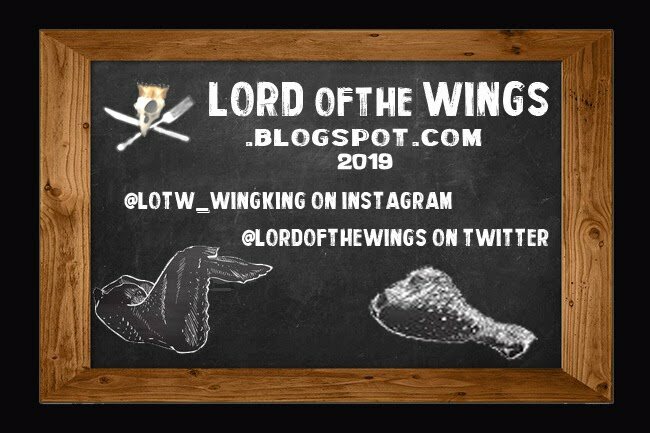 The first couple of wings I dipped in here I really liked. It had a nice peppery kick, it was thick, it was good. But the more I ate it, the more I grew to dislike it. That's because that tomato flavour just seemed to get stronger and stronger. Like cloyingly tomato. I had to put it aside. It wasn't killer heat, it was above a hot, but it wasn't going to make you cry or cough. This was my favourite - it's basically a honey mustard with a hint of smoky flavour. According to Caity this is a popular sauce, especially in combination with the suicide. The suicide is homemade, but this is a commercial sauce. 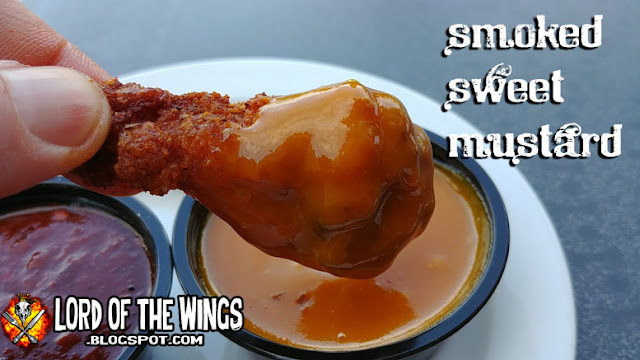 I'm not sure I'd want my entire order of wings to be this sauce, but paired with the Cajun, c'est magnifique. 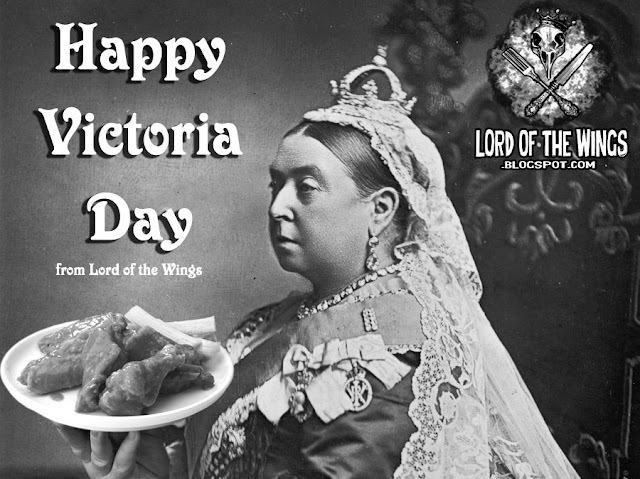 I'm sure the Queen would have had hot wings, right? Anyways, Have a great long weekend everyone! 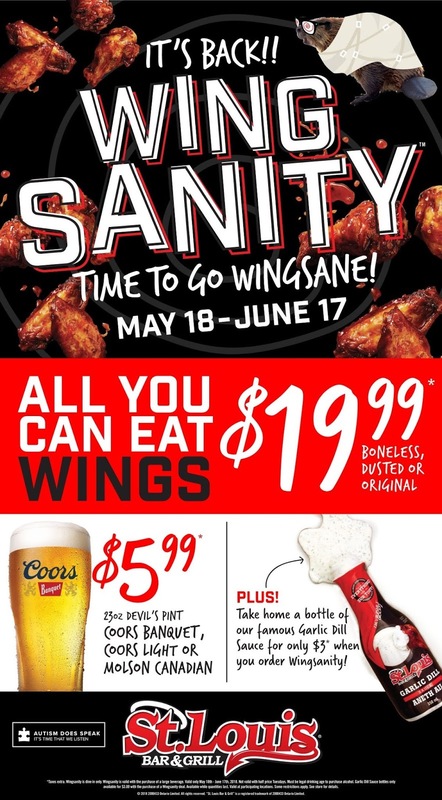 St Louis All-You-Can-Eat wing festival "Wingsanity" is back - for $19.99 it's all you can eat wings or boneless wings, all day long from May 18th to June 17th (father's day). Will you go 'wingsane'? I don't know how, and I don't know when, but I will, and it will be glorious. 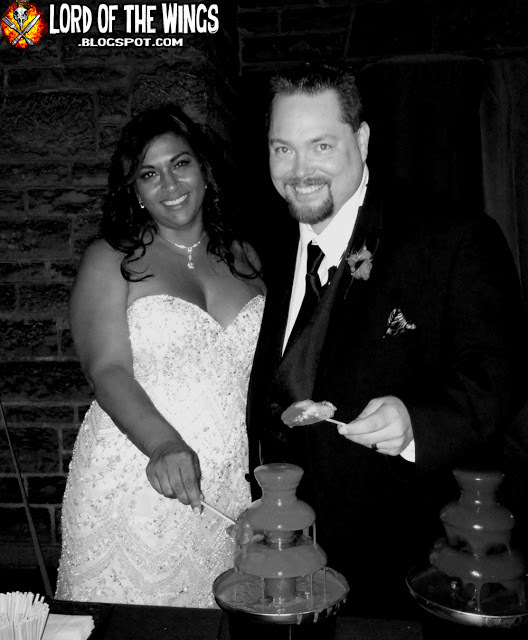 Sunday will be my 2nd Anniversary of the day I wed my beautiful wife, my Lady of the Wings. So here's throwing back to such an amazing day, an amazing lady, and some amazing wings dipped into our now famous chicken wing fountain! I had heard about Carlo's Pizza just over 10 years ago, but never did try their pizza. 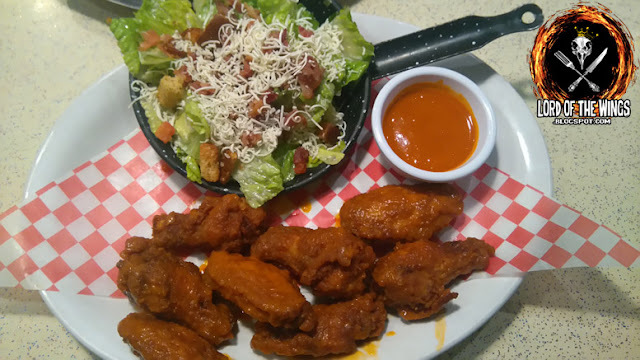 With my go to late night wing fix Casa Luna's closed for renovations, I decided it was the perfect time to try out Carlo's wing game. It was a late Saturday night and I pulled up to this pizza joint. 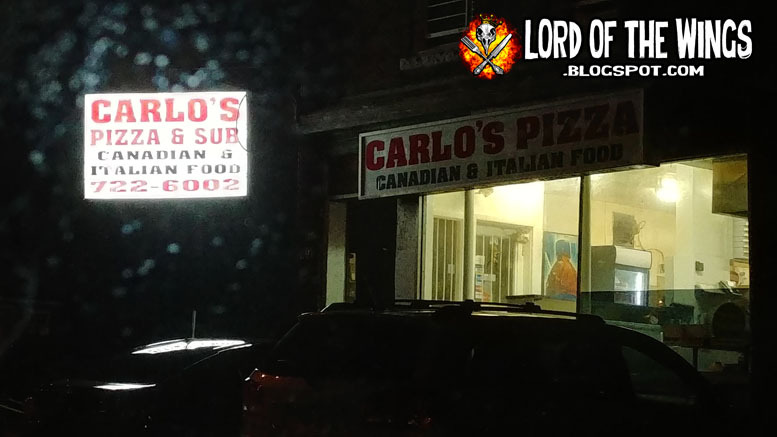 It's in the middle of a residential street in Wellington West area - the only business within a few blocks. 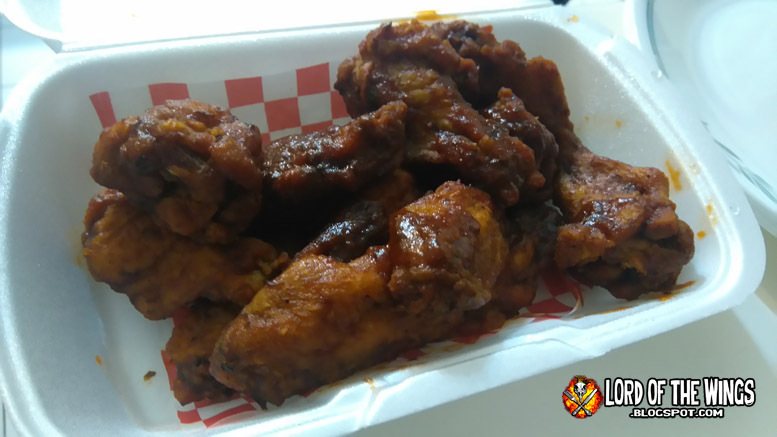 I actually called my order in before I arrived - I had some difficulty because my phone was cutting in and out, and the older lady on the other end of the phone had a thick accent, but eventually, I got my request for wings in ok. 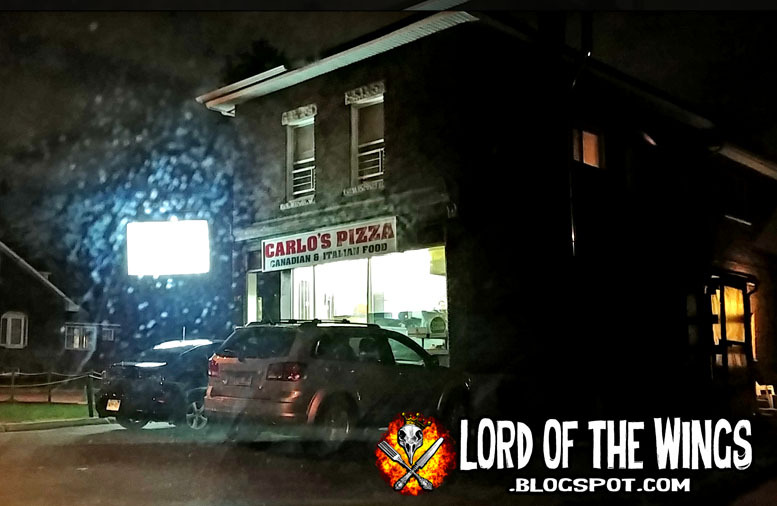 The inside is like many pizza places in Ottawa - bare bones and nothing changed in years. I was actually intrigued by the really old delivery maps from long ago still on the walls. I was surprised at the open display of all their ingredients (mustard, ketchup, oil etc) and I was surprised to see almost all were no name brands. I was also surprised at the staff - it was 3 pretty elderly ladies working at like 10:30-11pm at night. One sat at a table doing prep work while the other two shuffled around making pizzas, answering phones and giving out the food to pick up orders and delivery guys. They looked tired, but the one lady who was taking payments was super friendly - she gave me a free pop! I said no but she insisted. 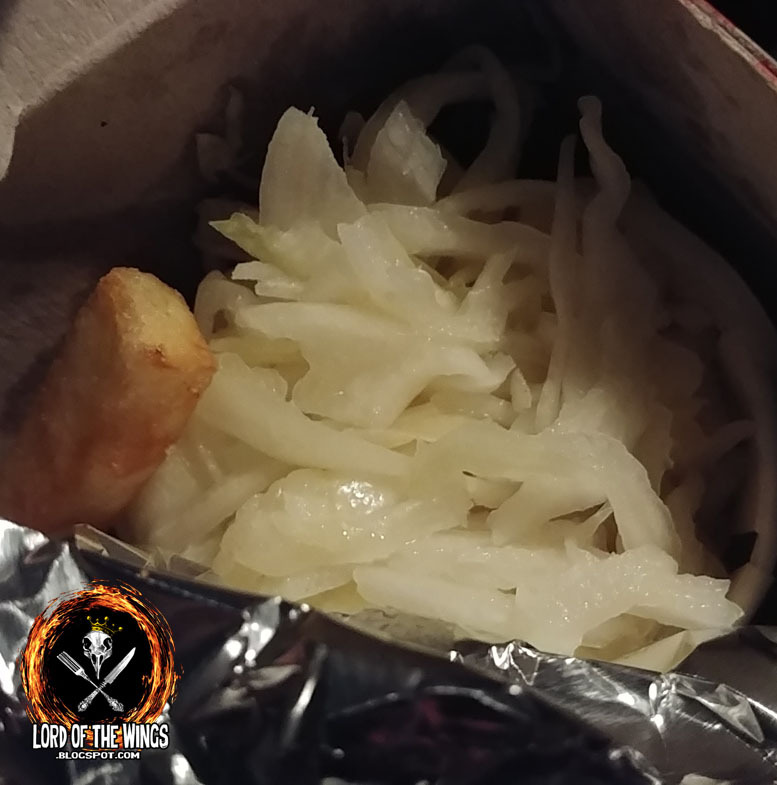 I didn't notice it when I ordered over the phone, but according to the take-out menu it's like a platter - comes with fries and coleslaw. 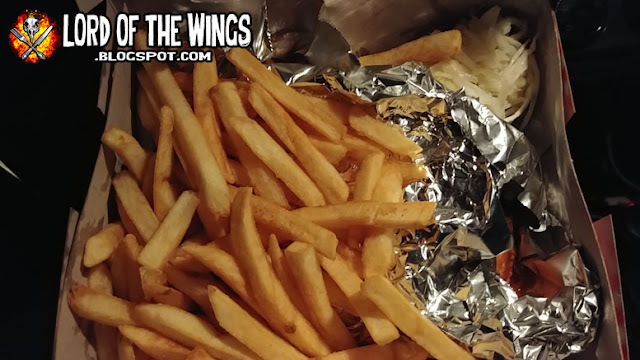 The food came in a cardboard box (yes - thank you for not using the Styrofoam containers!). They gave a very generous amount of fries that filled up almost 2/3 of the box. Unfortunately the fries were the frozen variety, so nothing special. I also would have liked to put on salt, vinegar, and ketchup, but that was on the counter on the restaurant and my order was wrapped up and stapled into a brown paper bag. 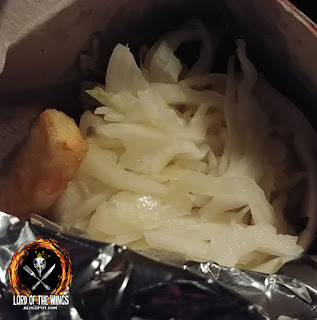 There was also a small cup of coleslaw - a vinegary slaw. I wasn't crazy about it, but I often am not. It was ok and a bit warm by the time I had it. 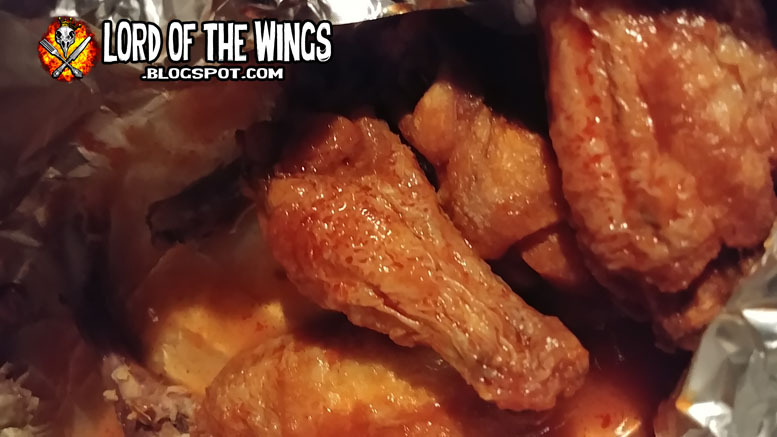 The wings that I had watched them deep fry, were put into tinfoil and wrapped up. They smelled good! Wings only come in an order of 12. 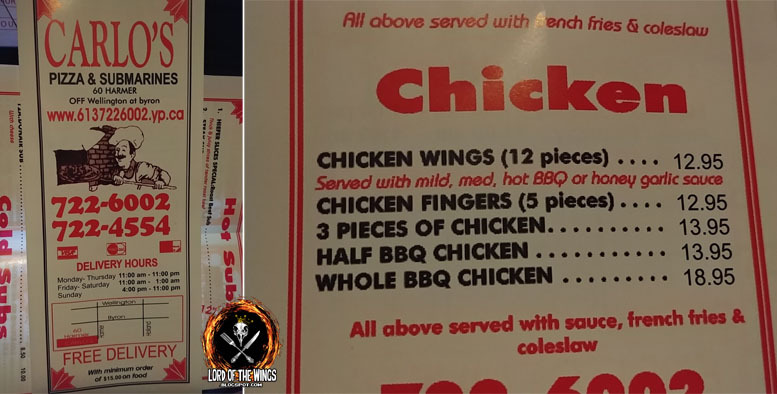 So there were 12 wings. 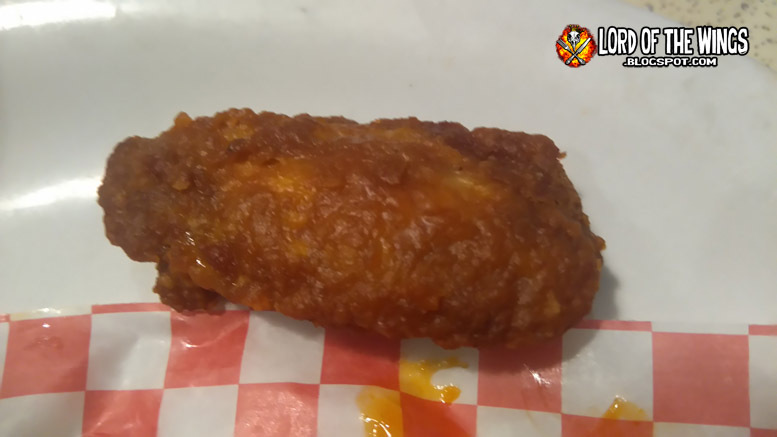 The wings were relatively small, and about a medium meatiness. Although the wings were fried and looked crispy, because they were wrapped in the tin foil they were basically steamed. The wings were thus pretty tender, but again, were kinda soggy due to the steaming. The sauce was a simple cayenne hot sauce. I'm guess Frank's or some sort of no name based sauce. 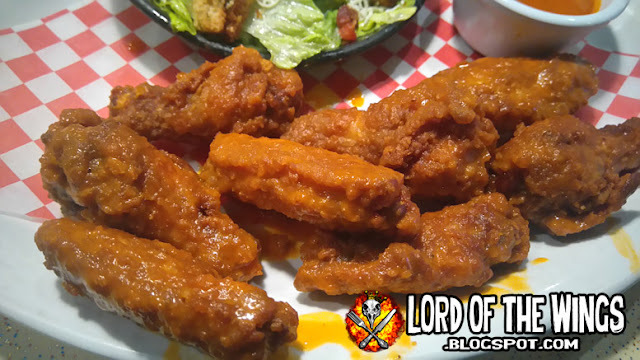 It was good - classic hot wings, and there was enough sauce for the wings to soak it up. Happiness Happened Here - "Horror Show"
Happiness Happened Here - " Bone Kindling"
May the 4th Be With You - Star Wars Day 2018! Did you even wing bro?